Fourth Row Center: Film Writings by Jason Bailey: Saturday Night at the Movies: "Babel"
From 2006: Let’s make this plain right from the top: You should absolutely see Babel, the new film from writer Gullermo Arriaga and director Alejandro González Iñárritu. It is a thoughtful, challenging drama, bursting with terrific performances. It’s a fine, fine film—but it is a disappointment. It is the third collaboration by these two ridiculously talented men from south of the border (following the brilliant Amores Perros and the unforgettable 21 Grams), and it is the first one that they don’t quite bring off. There are flashes of brilliance here, and moments of real power. But it never quite connects emotionally—either within its interlocking stories, or with its audience. Brad Pitt and Cate Blanchett are the marquee stars here, well-matched as an American couple on a Moroccan holiday who are the unexpected victims of an act of random violence—a roadside shooting, where Blanchett’s neck is pierced by the bullet of a shotgun fired by a local goat-herder’s young son. The Americans find themselves stuck in a tiny village waiting for some kind of help; the husband calls home and begs their maid, who is caring for their children, to cancel her son’s wedding the following day so that she can care for the children. She takes them to Mexico with her instead, which doesn’t go very well. The third thread involves a teenage Japanese girl who is mute (a trait which perhaps hits the film’s themes of communication breakdown a little too squarely on the head). Her connection to the rest of the film is revealed late in the film, and it’s rather a shaky link; indeed, her entire story is by the far the film’s weakest. The brilliant cinematographer Rodrigo Prieto (whose sizable resume includes Brokeback Mountain, 25th Hour, 8 Mile, and Frida, as well as the previous Iñárritu/Arriaga films) is at top form here, expertly juggling the neon nightclubs of Japan with the sun-soaked Moroccan landscapes. The score, by Oscar winner Gustavo Santaolalla (also of Brokeback), is downright gorgeous. And the performances, as mentioned, are top-notch; Gael Garcia Bernal is wonderfully effective in a small-ish but important role, and Pitt, who continues to exhibit a savvy eye for career longevity, is (unsurprisingly) quite good. The deliberate pace is something of a problem; this moviegoer appreciated the delicacy with which the opening passages unfold, but it gets awfully draggy in the middle (especially during a visit to a Tokyo nighclub, which goes on far longer than it has any reason to). But we are treated to scenes that might have been dropped from a more conventional telling of this kind of tale, particularly a later scene between Pitt and Blanchett that is startling in its intimacy and honesty. Arriaga’s screenplay takes some interesting turns, although far too many of its stops have been given away by the film’s ubiquitous trailer (particularly the powerful moment when the Moroccan police realize who their “shooter” is). What Babel is missing, which was present in his two previous films with Iñárritu (as well as his brilliant screenplay for Tommy Lee Jones’s Three Burials of Melquiades Estrada), is the final beat that pulls the film’s emotional center to the foreground. The ending of 21 Grams was particularly shattering, a moment of brutally poignant truth that hits the viewer like a punch in the gut. 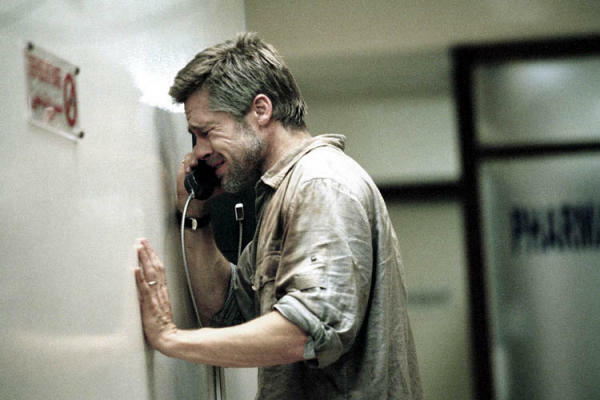 Babel comes close, with a too-brief scene where Pitt loses it on a pay phone (you’ve seen that scene in the trailer, too), but then it drops us back into the Japan story, which wraps up in a manner that is too easy (and somehow, simultaneously, too abstract). Again, for clarity: This is not a bad review. Babel is recommended. And frankly, if this were Iñárritu and Arriaga’s debut film, its faults would probably be more easily overlooked. But this is their third go-round with these themes and this story construction (indeed, all three films are basically centered on an auto accident), and it is the least successful of the three. Which doesn’t mean you shouldn’t see it anyway. "Babel" is available on Blu-ray, DVD, and Netflix Instant.